Salt cedar plants are spreading shrubs or small trees, 5-20 feet tall, with numerous slender branches and small, alternate, scale-like leaves. The pale pink to white flowers are small, perfect and regular, and arranged in spike-like racemes. The distinct petals and sepals occur in fours or fives. The fruit is a capsule (Hitchcock and Cronquist 1961). Salt cedar (Tamarix) taxonomy is currently in a state of confusion. The number of species in the genus has fluctuated widely because members of the genus have few constant differentiating features, and taxonomists have disagreed over which features are most important. Eight species have been listed as introduced into the United States and Canada. These species can be effectively divided into two groups. Tamarix aphylla, an evergreen tree, does not sexually reproduce in this climate, so it is not seriously invasive. Deciduous, shrubby species, including T. pentandra, T. tetranda, T. gallica, T. chinensis, T. ramosissima, and T. parvifolia, as described by various authors, are more serious invasive threats (Rodman 1989). Some authors continue to distinguish many species, while others consider these shrubby plants as one variable species or hybridizing group best designated by the single name T. pentandra (Sudbrock 1993). Ecological Threat: Saltcedars are fire-adapted species and have long tap roots that allow them to intercept deep water tables and interfere with natural aquatic systems. Saltcedar disrupts the structure and stability of native plant communities and degrades native wildlife habitat by outcompeting and replacing native plant species, monopolizing limited sources of moisture, and increasing the frequency, intensity and effect of fires and floods. Although it provides some shelter, the foliage and flowers of saltcedar provide little food value for native wildlife species that depend on nutrient-rich native plant resources. Biology & Spread: Saltcedar spreads vegetatively, by adventitious roots or submerged stems, and sexually. Each flower can produce thousands of tiny (1/25-inch diameter) seeds that are contained in a small capsule usually adorned with a tuft of hair that aids in wind dispersal. Seeds can also be dispersed by water. Seedlings require extended periods of soil saturation for establishment. History: It is believed that nurserymen on the east coast made the first introduction of saltcedar to North America in 1823. Saltcedar appeared on the west coast, where it was apparently brought in from eastern nurseries. It was planted as an ornamental in the western United States, but by the 1870?s, it was reported to have escaped cultivation. By the 1920?s, saltcedar was becoming a serious problem, spreading rapidly through the watersheds of the southwest (Brotherson and Winkel 1986). U.S. Habitat: Seedlings establish most frequently in soils that are seasonally saturated at the surface. It appears to grow best in saline soils (up to 15,000 ppm sodium), but saltcedar is adaptable and tolerant of a wide variety of environmental conditions (Brotherson and Field 1987). Brotherson, J.D. and D, Field. 1987. Tamarix: Impacts of a successful weed. Rangelands 9: 110-112. Distribution: The genus Tamarix is native to a zone stretching from southern Europe and north Africa through the Middle East and south Asia to China and Japan. There are a few species in disjunct parts of Africa (Rodman 1989). 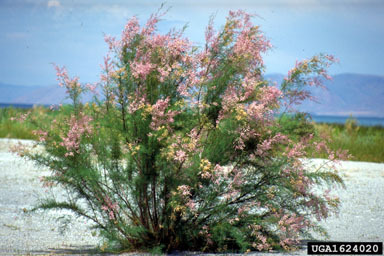 Saltcedar is now established in many moist spots in the desert regions of the western United States (Hitchcock and Cronquist 1961). Rodman, J. 1989. Reflections on Tamarisk bashing. Proceedings of the First Annual Meeting of the Society for Ecological Restoration. Management of saltcedar requires a long term commitment to maintain at low levels and prevent reinfestation. A variety of methods have been used in the management of saltcedar, including mechanical, chemical and biological. The most effective management probably involves a combination of these. Baum, B.R. 1978. The genus Tamarix. The Israel Academy of Sciences and Humanities, Jerusalem. Carman, J.G. and J.D. Brotherson. 1982. Comparisons of sites infested and not infested with saltcedar and Russian olive. Weed Science 30:360-364. DeLoach, C.J., M.J. Pitcairn, and D. Woods. 1996. Biological control of saltcedar in Southern California. In: Joe DiTomaso and Carl E. Bell, eds., Proceedings of the Saltcedar Management Workshop, Rancho Mirage, California, pp. 30-31. Howe, W.H. and F.L. Knopf. 1991. On the imminent decline of Rio Grande cottonwoods in central New Mexico. Southwestern Naturalist 36(2):218-224. Hudson, Laura E. 1999. Climatic and hydrologic effects on the establishment of Tamarix ramosissima in the cold desert of northern Wyoming (Bighorn Lake). M.S. Thesis, University of Montana, Missoula. Jackson, N.E. 1996. Chemical control of saltcedar (Tamarix ramosissima). In: Joe DiTomaso and Carl E. Bell, eds., Proceedings of the Saltcedar Management Workshop, Rancho Mirage, California, pp. 21-27. The Nature Conservancy. Tamarisk: Element Stewardship Abstract. In: Wildland Weeds Management & Research Program, Weeds on the Web.